Penny is a ten year old Collie who would love a retirement home. She is not fond of cats and would like to be the only dog in the household. She would really benefit from a secure garden that she could run about in, and a nice bed indoors. She likes walking on a lead and is a happy girl with a lovely nature. Nina is about 6 years old. She would like a quiet home with a secure garden. She is not fond of cats and would prefer to be the only dog in the household. She also does not have a good sense of safety around cars. She is, however, a really sweet girl who is very good with children. She would make a lovely companion to a household. Mr Grey is looking for a special home-he can be a grumpy chap with people at times but loves other cats! Experienced cat owner needed! Tsoko was a beautiful, loyal, and loving cat. She seemed to either make everybody smile or make everyone get mad. She was a cheeky cat, always whining for food! I have experienced many enjoyable moments with her, but my favourite of all was when she hid in the pile of toys I had made. She was just peeking out, making all of us laugh. Through tears and laughter, she has always been there for me. Both friend and foe will miss her. Thank you Tsoko for a life of love. At the age of sixteen, I hope you Rest In Peace. 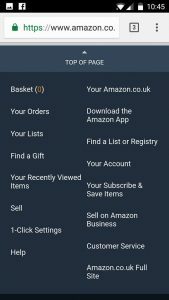 I have now set up an Amazon Wish List with thanks to the idea from one of our overseas members (Liz) and have placed in a few items that the sanctuary uses on a daily and weekly basis. Please be advised that our delivery address and telephone number is also included for your convenience and should you wish to avail of using this list a photo and walk through is attached. 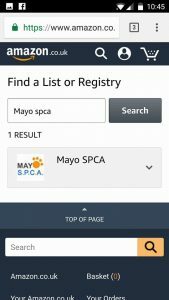 Type in Mayo spca and click search and hey presto there is our wish list. Congratulations to Niamh Waldron-the winner of the signed Mayo Jersey! Hope you enjoy watching the match in style Niamh! Michelle Courtney, a brilliant foster Mom to many MSPCA cats and dogs is a visual artist and printmaker. She has been working on some fundraiser pieces which she is very kindly donating for auction. 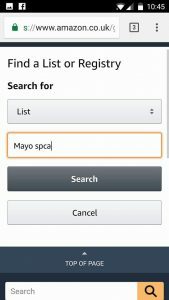 All monies raised in this auction will go to the animals of the Mayo SPCA CLG and Michelle has kindly accepted the cost of postage if the winning bid is overseas. 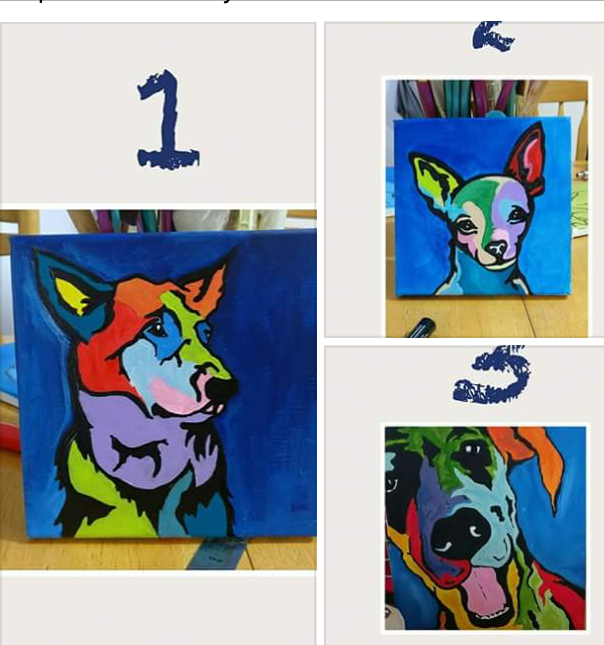 So we have been given these 3 bright and colourful canine portraits to auction to the highest bidder. They are all limited edition original acrylic on canvas paintings that will not be replicated and will be signed by Michelle herself. Bidding will start from today and will run until 9pm Wednesday 6th September 2017! We have chosen to start the bidding at €15 euro and the highest bidder for each painting will be announced on Thursday 7th September 2017. The winner will be notified via Pm and Payment method will then be arranged with you via either paypal/cheque /postal order or cash if local to Ballyhaunis and secure delivery scheduled. This is a great opportunity to add to your art collection or maybe a birthday present, or perhaps dare we say a christmas present for that special someone you know who loves dogs. Pictures will be numbered 1, 2 and 3 and bidding comments are to be placed under the photo of the piece you wish to bid for. Good luck and happy bidding and remember everything raised goes straight back to the animals in our care. Jessie enjoying her brilliant new home! Acoustic Sessions Gig in Westport this weekend! Four young local Mayo musicians-Matt Taylor, Sarah Deegan, Grainne Fahy and Joshua Dowling will be tantalising us with renditions of some of our favourite tunes along with some of their very own original songs. 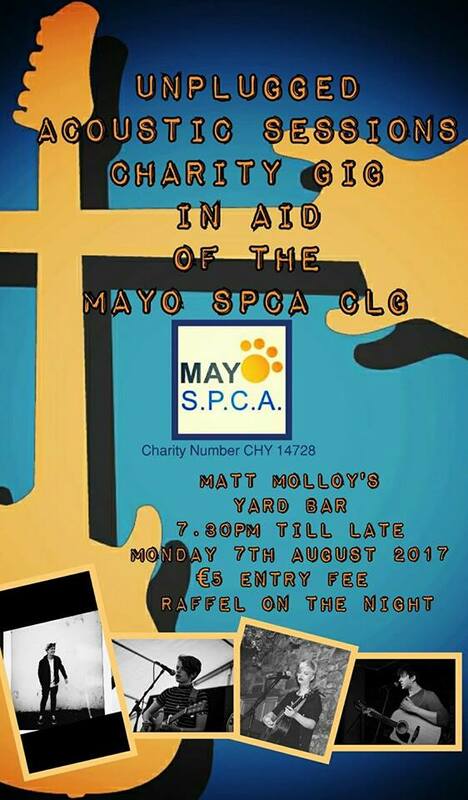 What better way to round off a bank holiday than spending the Monday evening listening to the talent of these guys in such a wonderful famous musical setting with all proceeds kindly being donated to the Mayo SPCA CLG. A raffle will also be taking place on the night during the interval so you may even have the opportunity to win a wonderful prize that has been kindly donated by shops and locals of Westport. Jimmie Connor picturered here receiving a cheque on behalf of Mayo SPCA from Seamus Hora. 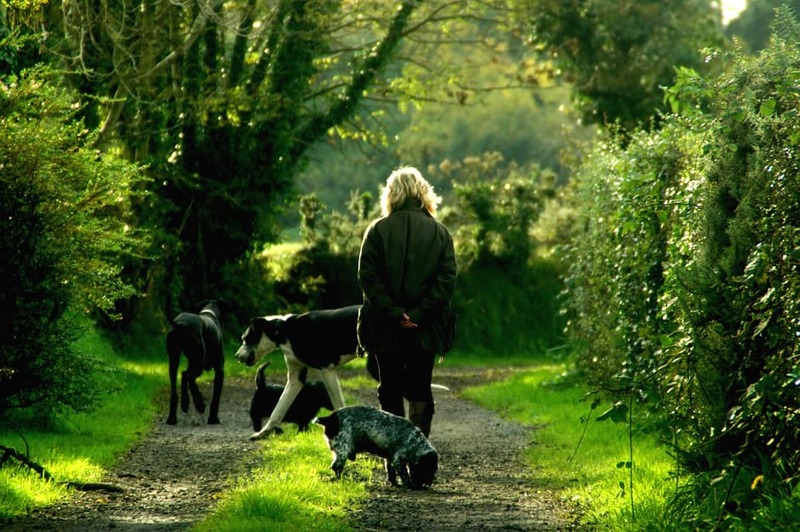 We wish to thank Seamus most sincerely for his generosity towards the animals in our care. From the sames of his lovely poetry anthology, ‘Memories and Reminiscences’ he has donated €348-€1 for every copy sold! Bless you Seamus-we are all-both 2 legged and 4 legged-most grateful to you! 10am–12.30pm and 3pm–6pm Mon – Saturday. All visits are by appointment only. You might not be in a position to adopt or foster a pet, but would like to help. All donations, no matter how large or small, are greatly needed and appreciated.